Aloysius Harry Simmons (May 22, 1902 – May 26, 1956), born Aloisius Szymanski, was an American baseball player. Nicknamed "Bucketfoot Al", he played for two decades in Major League Baseball (MLB) as an outfielder and had his best years with Connie Mack's Philadelphia Athletics during the 1930's. 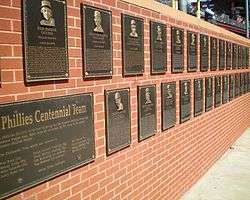 He also played with the Chicago White Sox, Detroit Tigers, Washington Senators, Boston Braves, Cincinnati Reds and Boston Red Sox. He played from 1924 through 1941, then appeared in 1943–44. He earned a lifetime batting average of .334. He hit .340 or better in eight different seasons, with four seasons of better than .380. 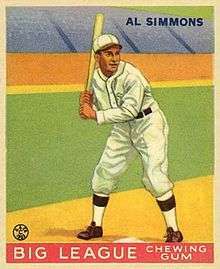 He also compiled 200 hits or better in a season six times, with five of those being consecutive (1929–33), and 199 and 192 hits in 1926 and 1934 while only playing 147 and 138 games in those years. 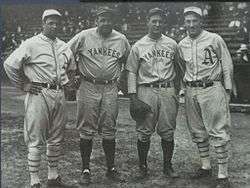 He also hit for power, finishing in the top six in AL in home runs for seven consecutive seasons (1925–32). He also hit .329 with 6 home runs, 17 RBI, 15 runs scored and .658 slugging percentage in 19 World Series games. Simmons was also a fine outfielder in his era, recording a career .982 fielding percentage. ↑ "Szymanski, Aloysius Harry (Al Simmons)". Pennsylvania Center for the Book. Retrieved December 28, 2014. ↑ "Athletics sell three big stars to Chicago Sox". The Tuscaloosa News. September 30, 1932. Retrieved January 21, 2015. ↑ "Al Simmons sold to the Boston Bees". The Milwaukee Journal. December 29, 1938. Retrieved January 21, 2015. ↑ "Illness forces Simmons to quit as Indian coach". Toledo Blade. April 4, 1951. Retrieved January 21, 2015. ↑ "Al Simmons left enviable record". The Miami News. May 27, 1956. Retrieved January 21, 2015.